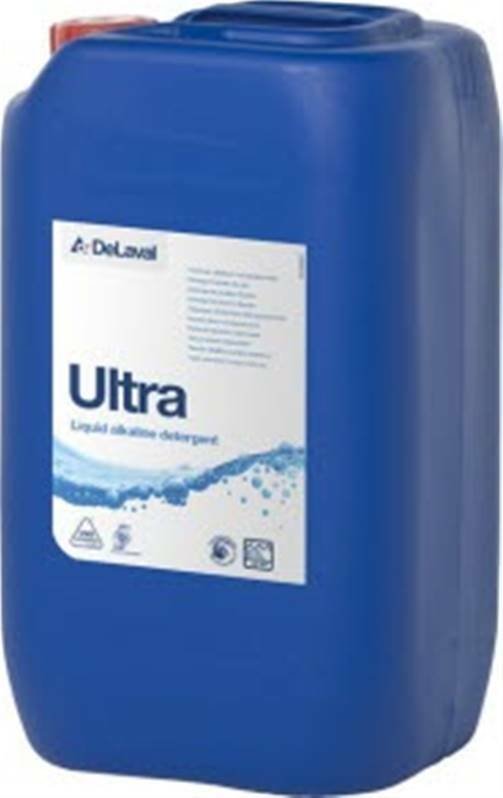 Ultra is a chlorinated and phosphated liquid alkaline CIP (cleaning in place) detergent developed for use on dairy farms in hard-water environments. It cleans and disinfects efficiently and works well in all water hardness conditions. 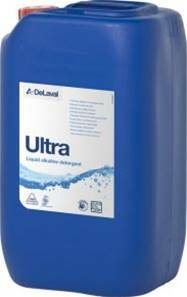 DeLaval Ultra can be used as part of alternate cleaning or alkaline-dominant cleaning routines, and is suitable for automatic dosing systems. It is gentle on milking equipment as well as liners and other rubber parts, and can also be used for automated milking solutions. Ultra has been developed, tested and manufactured in our DeLaval factories to the highest quality-control standards, ensuring consistent product quality. •Dosage between 50 ml and 100 ml per 10 litres of water.